I was 9 when I first realized that my father was being eaten alive by the monster of addiction. By age 16, my parents had divorced after 20 years of marriage. Contact with my father was sporadic over the next decade, and of decreasing frequency. At one point I had not seen my father in five years. I had not heard from him in three. 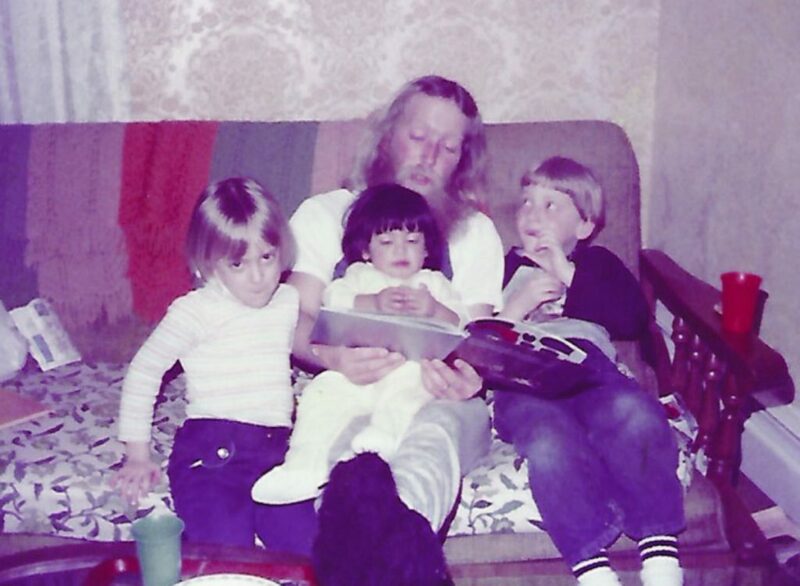 Amanda A. Meader (left) with her father and siblings in 1983. Amanda A. Meader is a practicing attorney in Central Maine, where she lives with her husband and two dogs. I discovered he was in Portland when I heard a radio news story about increasing violence against the homeless. I heard a man who went by “Z” speak of being stabbed in the back while sleeping under the Casco Bay bridge. I knew that my father went by “Z,” but hoped that I had misheard or misunderstood. I had not. Knowing that my father had a place to live meant that in the winter, when the temperatures dipped below zero, I knew he was warm. It meant that I knew where to find him, so I could send him letters and visit. It meant that he had reliable access to a telephone and could call his children. It meant that he was eating more and walking better. It meant that he had a bed. And a toilet. And a shower. He had a home to go to, instead of a home that he carried in a knapsack. And it meant that my siblings and I were able to visit, and sometimes, just for a moment, when we laughed at something funny my father had said, we were able to feel young and safe again. We’ve all had, or will have, heavy sorrows in our lives. My heaviest sorrow is the loss of my father to untreated mental illness and alcoholism. Beloved by many and helped by countless, still he lost his battle at age 58. Watching my father’s struggles was a painfully long goodbye. Fortunately, Logan Place gave a father and his children the chance to once again say hello. For all the years he wandered in parts unknown, I looked to the night sky to find him. And now that he is busy making his home among the star dust, I look for him there still. But how grateful I am for those six years at Logan Place.